Funnel readers to our blogs and web site to learn more about our services and capabilities. Encourage folks to keep in touch and contact us. 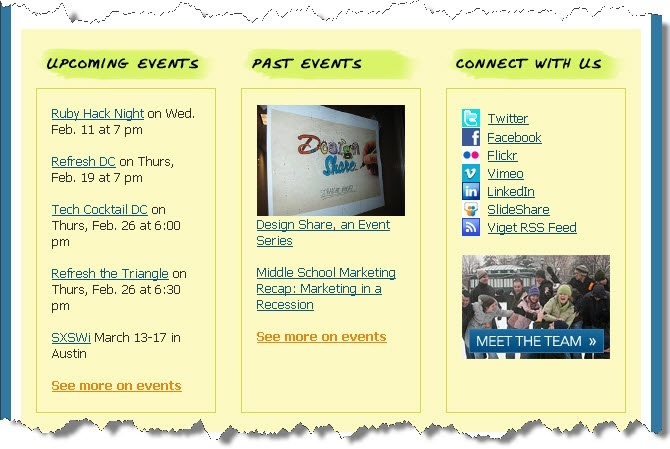 Our 2008 newsletter provided readers with a great summary of the month’s happenings and exposed subscribers to our four labs' blogs. 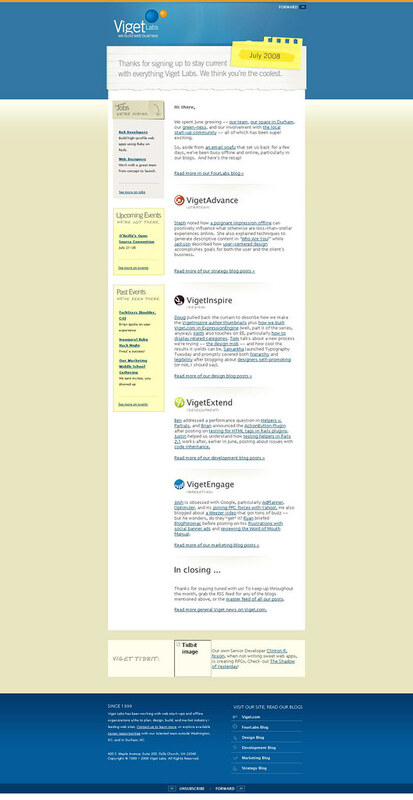 The design did a great job of incorporating elements from the Viget web site and delivering information that was customized, timely, and relevant. The results were strong: open rate hovered around 40 percent and click-through rates averaged a solid 17 percent. So if everything was good, why change? Well, Best Practices get better. 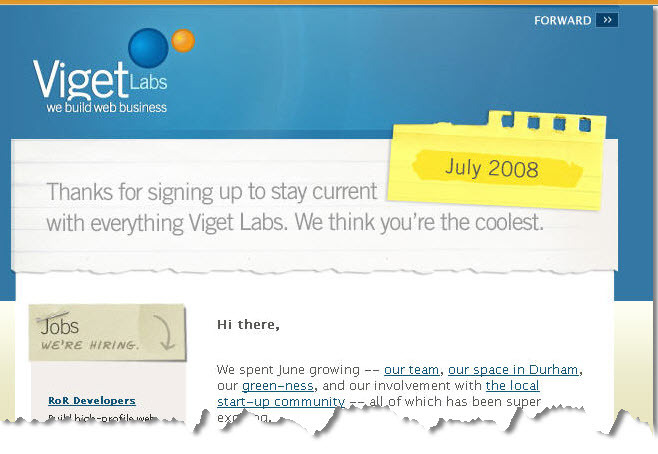 A lot has happened in the online space (and at Viget) in the last 12 months, and I thought it was important that our newsletter not only reflect the latest trends and Best Practices but show more of our personality. 1. We’re doing more with the first 400 pixels: We added monthly Flickr pictures for a more personal touch and started the Four Labs Blog summary higher on the page. We wanted folks to get some meat in the preview pane. 2. We increased the width of the newsletter from 600 pixels to 650 pixels in an effort to serve up relevant content and encourage readers to "read more." 3. We gave readers quick access to connect with us on a variety of social media channels: Twitter, Facebook, and Vimeo, for example. I think it's important that social media be incorporated in all that we (and our clients) do. From Twitter feeds to links in email blasts, we should help readers choose how and where they want to connect and engage with us. 4. We eliminated the lengthy summaries of blog entries and replaced them with easy-to-digest bulleted lists that are more scannable. As with all projects at Viget, this was a collaborative effort. Thanks to Peyton, Emily, and Steph for getting us this far.